The coronaviruses are members of a family of large, single-stranded RNA viruses that replicate in the cytoplasm of animal host cells. SARS-CoV is a type of coronavirus, which has been identified in patients with SARS; thus this novel coronavirus might have caused SARS. To prove this hypothesis, further specimens from patients with probable and suspected SARS to healthy contacts of patients affected by SARS were tested. Might SARS coronavirus recombine with other human coronaviruses to produce an even more deadly virus? In Hanoi, Vietnam, records have shown that although there are high numbers of patients with probable cases, there are also high numbers of healthy contacts of patients affected by the same outbreak. Therefore, this provides supporting evidence of an association between the novel coronavirus and the disease. 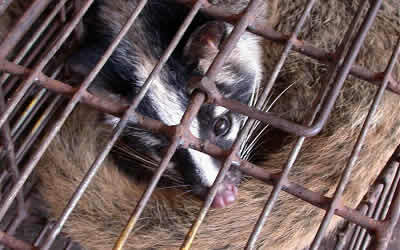 2.1.1 A civet cat in a cage (photo provided by Faculty of Medicine, The University of Hong Kong, 2004). There has been speculation that the novel coronavirus originated from palm civets, a cat-like mammal closely related to the mongoose, in Guangdong (China). These palm civets are a delicacy in Guangdong where people believe that humans became infected by slaughtering the animals rather than consuming the infected meat. Recently, the SARS outbreak has made a comeback, and there is speculation that this might be a different form of the coronavirus. Yet, in the past, recombinations of viruses of different groups have never occurred; therefore, a recombination between SARS virus and HCoV is not likely.